Formed back in the early 90's, San Francisco five man band Cairo delivered an easy to enjoy, well played and occasionally dynamic release on their self titled debut album from 1994. At first, a combination of `Union'-era Yes, `Falling Into Infinity'-era Dream Theater and a proggier take on Asia are obvious influences, but a surprising mid-album turn into supreme Emerson, Lake and Palmer-level technicality and showboating takes the album to another level altogether! After a brief announcing wailing electric guitar introduction that wouldn't sound out of place on any Dream Theater album, lengthy AOR rocker `Season of the Heart' properly opens the album. Despite a ten minute running time, it's a fairly straight-forward track with a main focus on melodic vocal passages and a catchy chorus with numerous little instrumental fills. Clean cascading electric guitar runs, quick little synth dashes and a soaring confident lead vocal from Bret Douglas, it's a somewhat cold, but certainly punchy opener, but not nearly the strongest piece on the album. `Silent Winter' sounds like a gutsy cross between Asia and U.K, another strong chorus with a romantic lyric and a nicely contained instrumental soloing spot in the middle. Those listening and not being too impressed at this point should persist, as the album all of a sudden bursts to life with an unexpected urgency and determination. `Between The Lines' blasts the listener right away, all Mark Robertson's delirious E.L.P keyboard bombast and Jeff Brockman's thrashing smashing drumming. A variety of synths, Moog and Hammond feature, with thick upfront bass and a bellowing unhinged vocal tear through this powerful piece. A softer 90's Dream Theater-styled number, `World Divided' is a quick return to a more AOR style, offering a `world gone wrong' lyric with a more restrained vocal and plentiful opportunity for lead guitarist Alec Fuhrman to offer emotional soloing. If the earlier E.L.P flavoured piece `Between the Lines' offered just a glimpse of what the band could really do, the 22 minute epic `Ruins at Avalon's Gate' shows them firing on all possible levels. It's as if the band were thinking `Well, if we only get this one shot to make a great album, let's do everything!' With only a brief vocal passage a few minutes in and a quick reprise at the end, this extended piece is mostly a grand instrumental showcase for the band, a dazzling array of tempos seamlessly shifting back and forth, heavier passages, pompous fanfares and dizzying drama. Rob Fordyce's chunky galloping bass workout is a standout, as is the total dominating slaughtering (but in a good way!) complete keyboard overload from Robertson, his Triumvirat-like piano even reminds me of their `Illusions on a Double Dimple' album. Exhausting and thrilling in equal measures, but thankfully despite the band darting through so many ideas, the piece never sounds directionless. Album closers really don't come much more satisfying than this one, possibly one of the finest vintage/retro styled keyboard dominated epics since the Seventies, and fans of those above mentioned bands should adore it. Occasionally the 90's sheen gives the album a slightly flat and lifeless sound (most noticeable on the first proper track `Season of the Heart'), but eventually the sheer melodic compositional skills of the band and their talented instrumental displays more than grab hold of the attention. Have a bit of patience and take the time to listen to the whole of the album instead of making a rash judgement on the opening few tracks, and chances are you'll end up very impressed and surprised! 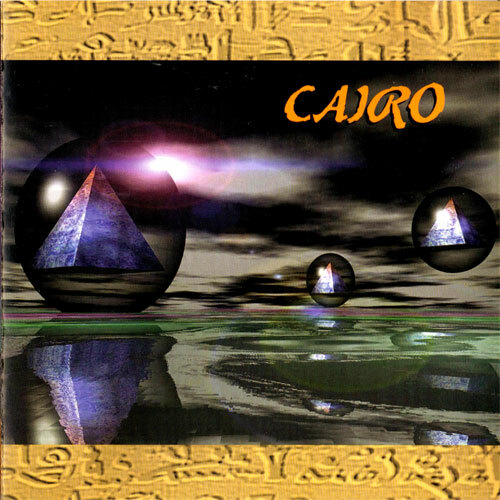 `Cairo' is an album well worth snapping up if you happen to come across it, and the band deserve a bit more attention and praise for their efforts here.